If the record breaking season 4 premiere of The Walking Dead is any indication of television viewer's taste, much like the unsatiated and unstoppable creatures themselves, there is no stopping the appetite for all things zombie-related in all forms of pop culture. Zombies used to be relegated to late night B-movies, but now it seems they have taken over all forms of media. The highly successful comic book series that The Walking Dead is based on just celebrated ten years of publication with more than 100 issues and counting. Even Archie is going to be roaming around the graveyard soon! What better way to celebrate the Halloween season than a "Friday Five" of some of the best zombiefied titles in our collections? 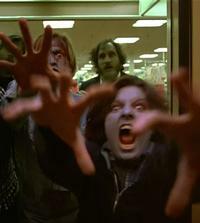 The first and foremost modern zombie movie of all time. George A. Romero's Night of the Living Dead is simple in its plot (strangers barricade themselves in a farmhouse, fending off hordes of bloodthristy ghouls) yet profound in its effect on cinema (helping to usher in D.I.Y. film making and the advent of the American "New Wave" of the 1970's) and society (subtly critiquing racism, violence, and American politics of the time). The film was selected for preservation in the National Film Registry of the Library of Congress. Special features for this release include interactive menus, production notes on the film, commentary from director George A. Romero, a making-of featurette, and theatrical trailers. A truly original take on the zombie genre, Max Brooks (director and comedian Mel Brooks' son!) uses oral history as his storytelling device to recount the decade-long conflict between humankind and the hordes of the unstoppable undead. The stories are collected from interviews that the narrator conducts with survivors from all over the world, describing in their own words the epic human battle for survival. This reads like the Ken Burns version of a zombie documentary on PBS! And yes, they made a movie "inspired" by this book, but the film adaptation is so loosely based on the written text, it really only uses the title and the fact that there are zombies running around. If ever there was a case for reading the book vs. seeing the movie, this is it. In other words: READ THIS BOOK! One of the first and most successful mash-up genre fiction titles, published by Philadelphia's Quirk Books in 2009. The combination of Jane Austen's classic 1813 novel, Regency-era romance, and zombies is really utter genius. What more could you ask for in a novel than romance, action, swordfights, cannibalism, ninjas, and of course, zombies?! I highly recommend the audiobook version around this time of year to put you in the Halloween spirit. It's like listening to a spooky radio play with British, classically trained actors. Those "meddling kids", Scooby-Doo, Shaggy, Velma, Daphne, and Fred, hop in the Mystery Machine and head to New Orleans to investigate the haunted bayous. They of course run into the usual cast of creepy characters impersonating ghosts and ghouls to scare them off, only this time they run afoul of actual zombies! This has all the classic trademarks of the television series from the 1970s and makes for fun and frightening family viewing during Halloween. Featuring the voice-over talents of Adrienne Barbeau, Mark Hamill, and Billy West! Still don't know what to be for Halloween and need costume ideas? Then check out this great how-to dvd from thirty-year veteran make-up artist, teacher and theatre costumer, Rachel Godollei-Johnson. She shows beginners how to use liquid latex, pancake make-up, theatrical wax, and a few odds and ends from around the house to create horrific and scary 3-D make-up effects for all your undead costume ideas. Learn the tricks of the trade and be the envy of all the other trick-or-treaters on your block on Halloween night! Browse our catalog for "zombies" or the "living dead", you'll sure to find something lurking from the shadows! And if you survive, you can check out the ghastly terror that lies within this horrific online exhibition! After watching Night of the Living Dead when I was about 8, I can't watch zombie movies ever again without terror. Awesome Friday Five! And it appears zombies are even hot with the Pre-K set. Check out "Plants vs Zombies: Brains and the Beanstalk" by Annie Auerbach.